I have learned so much marrying into a Chinese family. One of the first observations my husband and I made relating to our cultural differences was that (in general) Chinese people do not eat raw vegetables (salad is not a very Chinese dish) and they don’t cook their fruit (he tried apple pie for the first time with me). Chinese people are also very big on peeling fruit. Whereas I LOVE apple peels, etc. my husband had to acquire the taste since his father always peeled his apples (and the rest of the fruit he ate). My father-in-law will painstakingly remove the membranes from my children’s tangerines. Tangerine membranes are quite thin which makes this a very time-consuming job. 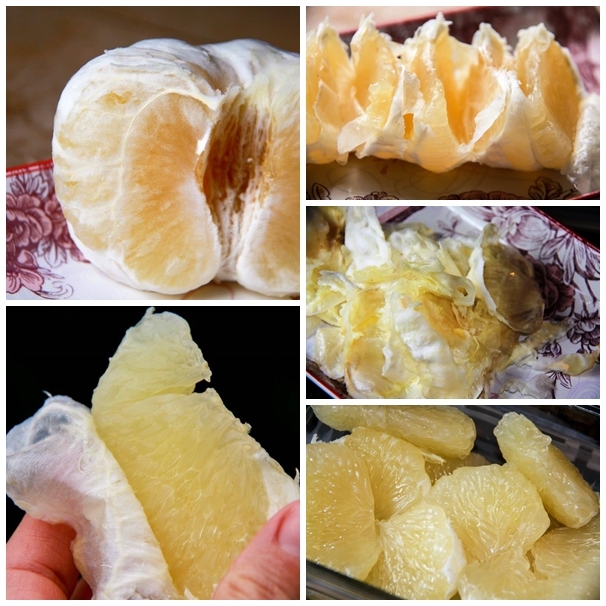 Fortunately it is SO EASY to remove the membranes from grapefruit and pomelos. I had never eaten a pomelo before meeting my husband. I always liked grapefruit, but I hated the time it took to prepare them buy cutting around the membranes, etc. All of this changed when my hubby showed me the Chinese way. The membranes on grapefruits and pomelos are very thick and loose which makes removing them a cinch. The white grapefruits at my local farmer’s market are so sweet and juicy right now which means that I have been eating a lot of them…always the Chinese way. 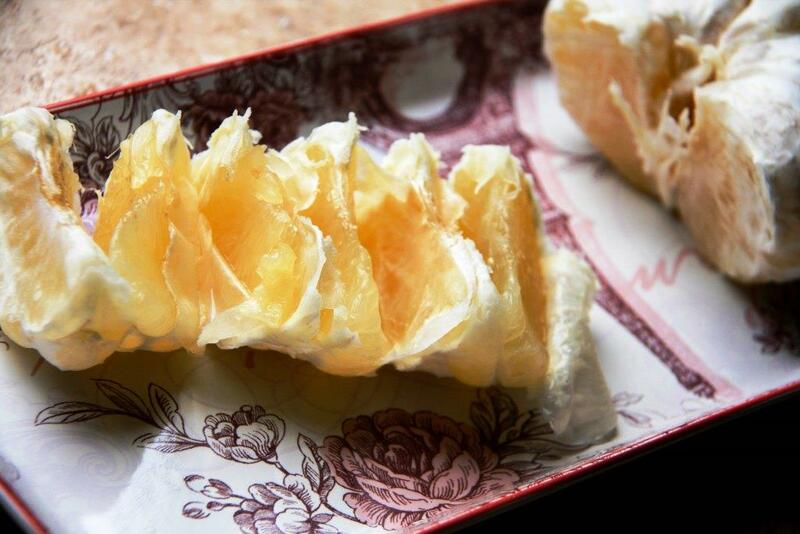 I remove the peel from the grapefruit and keep them in the fridge (whole) so they are ready for a quick snack. 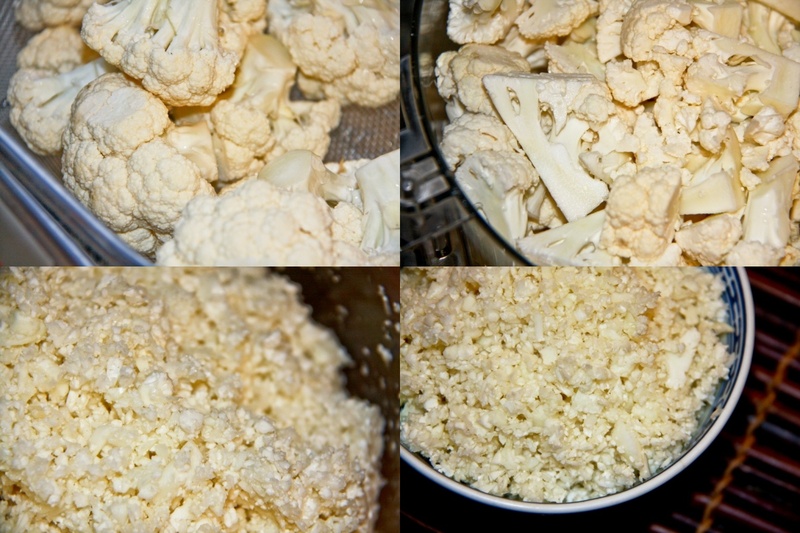 Remove the membranes as you eat them (this will keep them fresh). 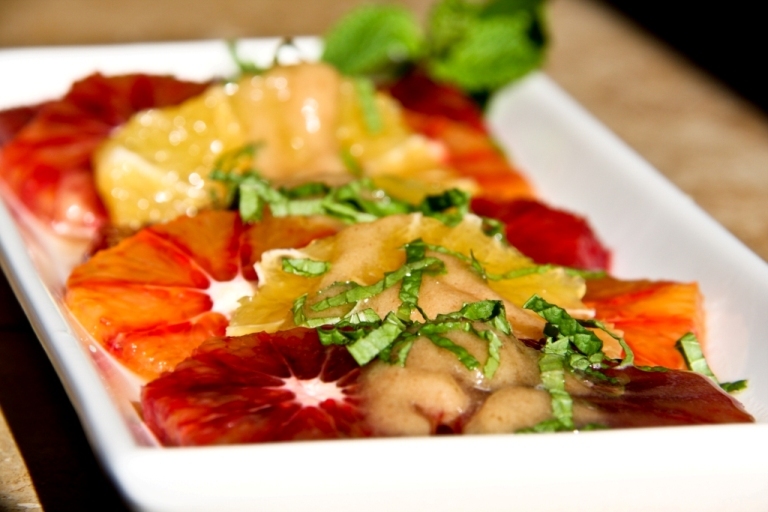 Have any of you tried eating grapefruit or pomelos this way? When I go grocery shopping and walk past the snack aisle I am always shocked by how many different fruit roll-ups there are, not to mention the fruit snacks. Trust me, I understand how good they taste…like candy, but that us essentially what they are. 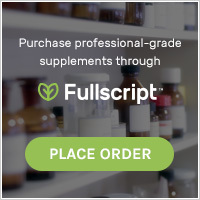 Have you ever looked at how much sugar they add? My guess is that the manufacturers feel they have to add so much sugar because they are probably using fruit that isn’t truly ripe as the basis of their product. I am so thankful that I have an Excalibur dehydrator. They are pricey, but I eased some of the hurt by buying a Factory Refurbished model ($199 vs. $299) which still has a 10 year warranty! I use my dehydrator a lot and have been using it a ton lately because there are such wonderful organic strawberries at my local farmer’s market. 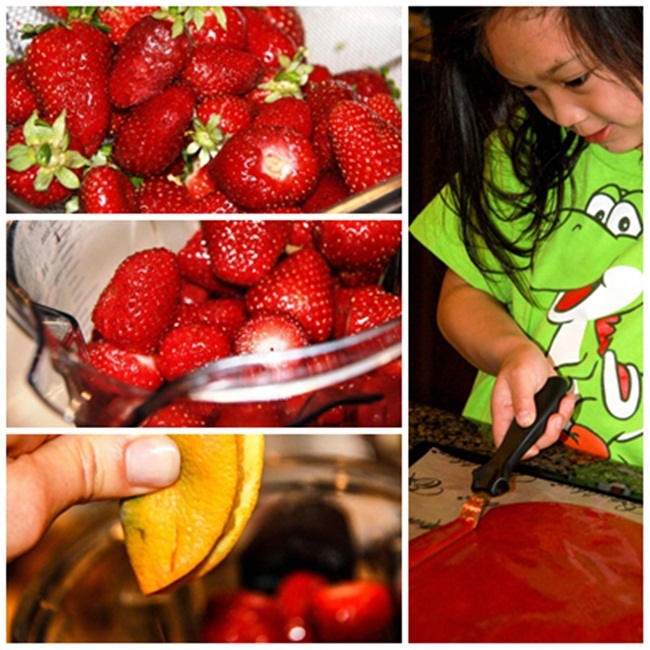 Making fruit roll-ups couldn’t be easier. Simply wash the berries, remove the stems, place them in your Vitamix high speed blender (I squeezed in an orange for extra flavor, however doing so is not necessary), blend until smooth, sweeten if necessary (you can use dates, maple syrup, stevia, honey), and blend again to incorporate the sweetener. Pour the mixture in batches on to your dehydrator trays lined with non-stick drying sheets, spread with an offset spatula (This tool is such a help…I first learned about this trick from Kristen Suzanne’s blog) as thin as you’d like making sure that it is evenly spread and there are no holes, and dehydrate at 125 until firm to the touch. I spread my roll-ups to about 1/8″ and they dehydrate within 3-4 hours. 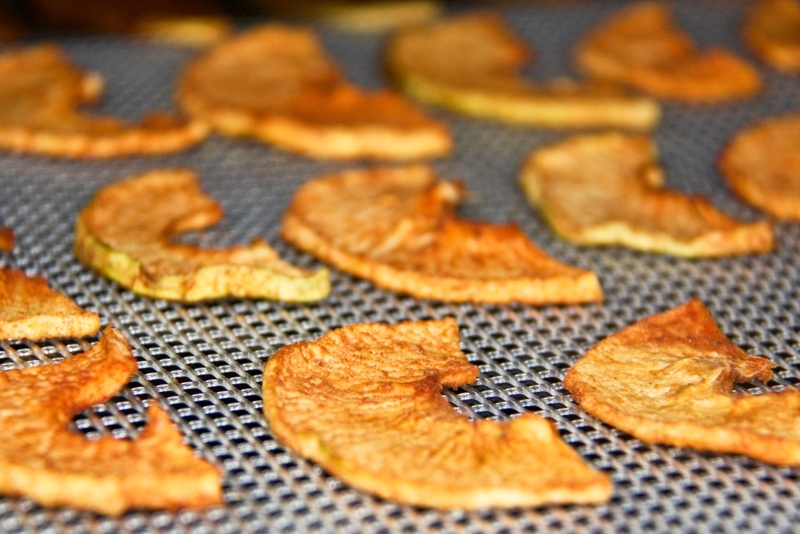 If you would like to keep the roll-ups “raw,” dehydrate at 115 degrees (it will take longer). 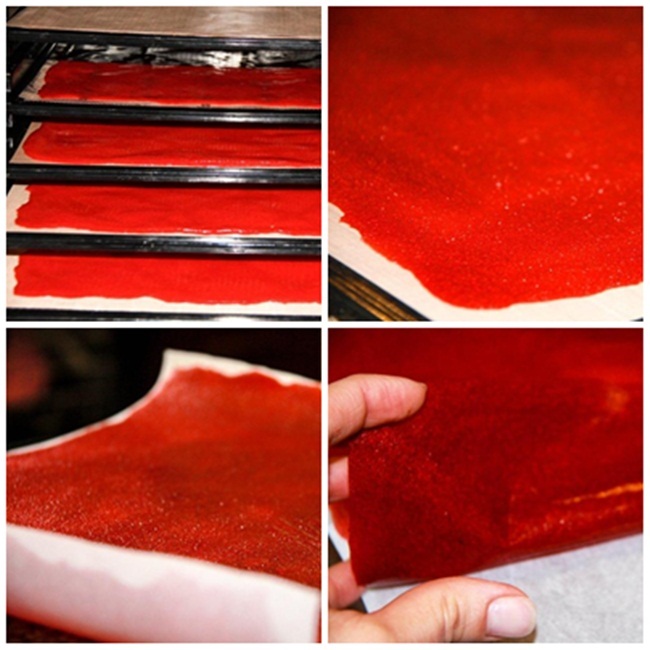 You can also make the roll-ups thicker, it will just take longer to dehydrate. 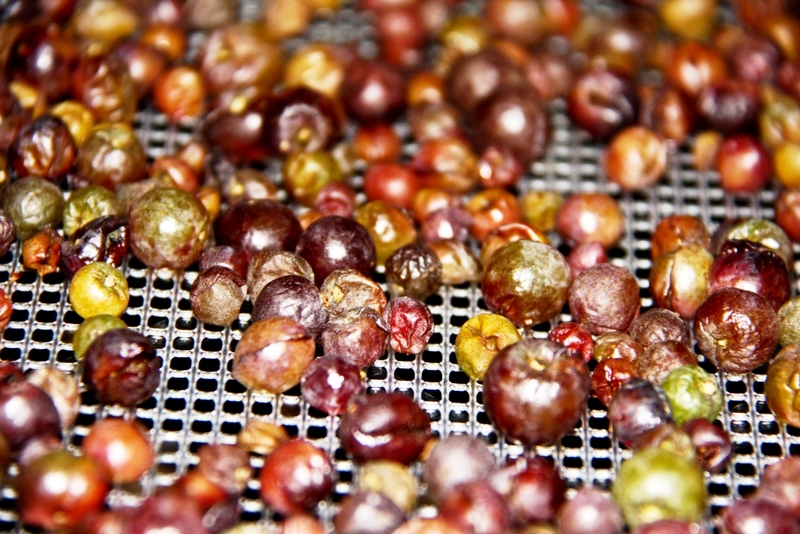 Once you remove the roll-ups from the dehydrator, allow them to come to room temperature and carefully peel them from the non-stick sheet. 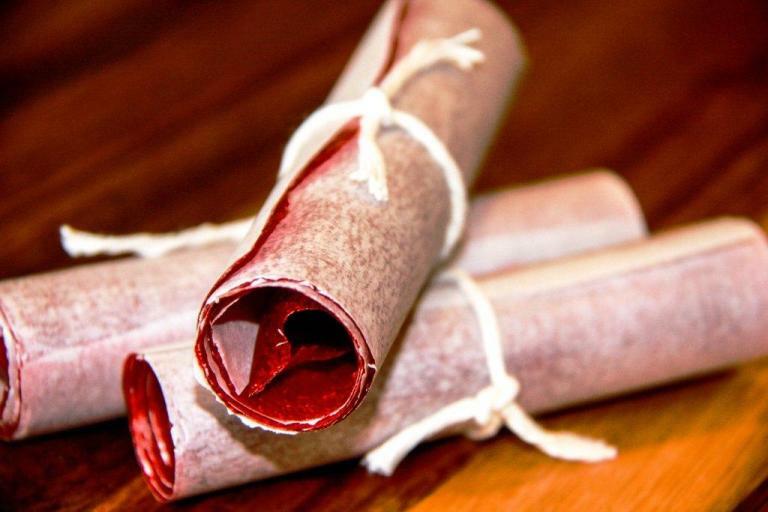 Line the back of the roll-ups with parchment paper, cut them to size, and roll them up! I store my roll-ups in glass jars. 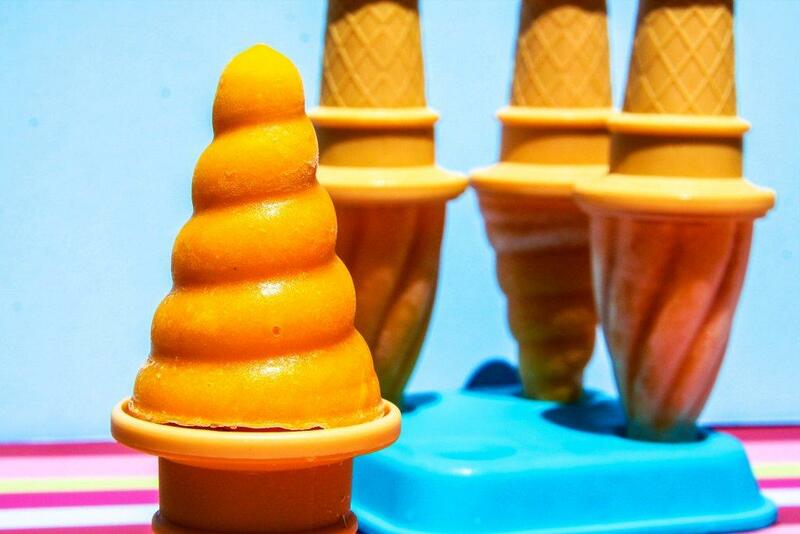 Recently I have used this method to make a ton of different flavors; mango, pineapple, apple cinnamon, and white peach. I was so pleasantly surprised by the pineapple fruit roll-ups…they were AMAZING!!! I can’t wait to make my next batch and have been dreaming-up all sorts of flavor combinations. 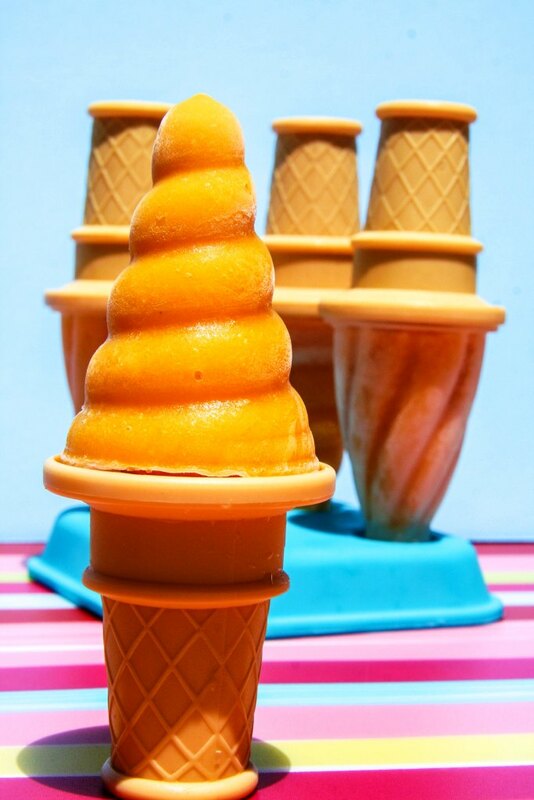 *TIP – try to keep the roll-up “batter” as thick as possible and do not add extra liquid if possible. 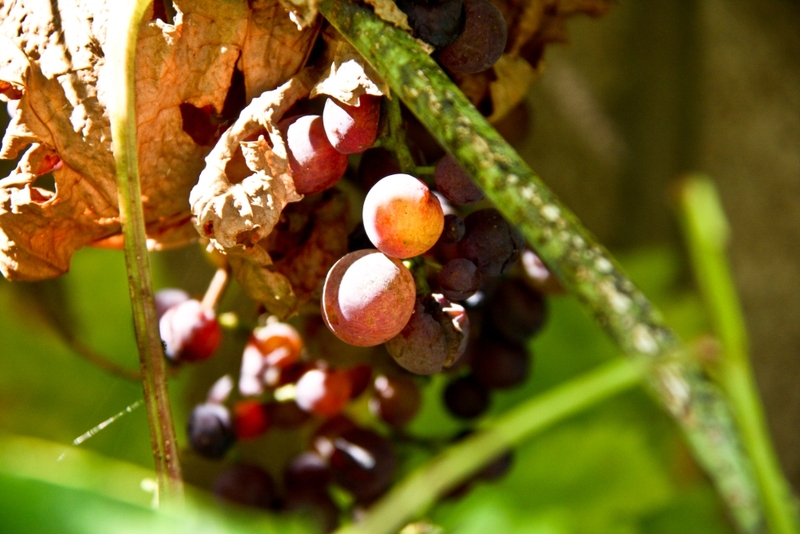 You will find that certain fruits are less watery than others i.e. 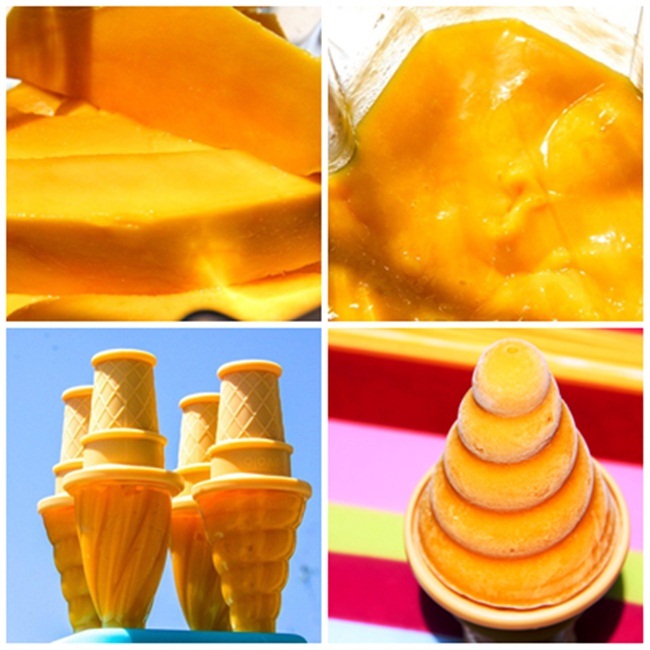 mangoes produce a thicker batter than apples do (the result is much more watery). 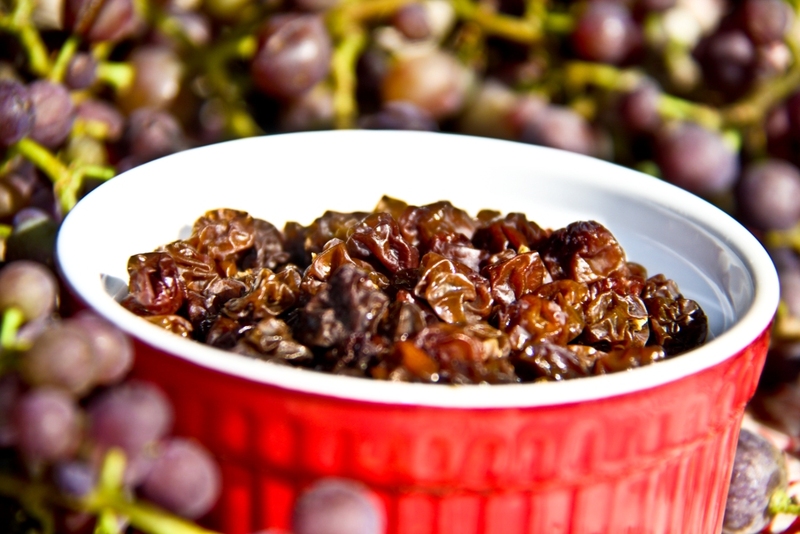 Dehydrating time will change depending upon which fruit / fruit combo you use. 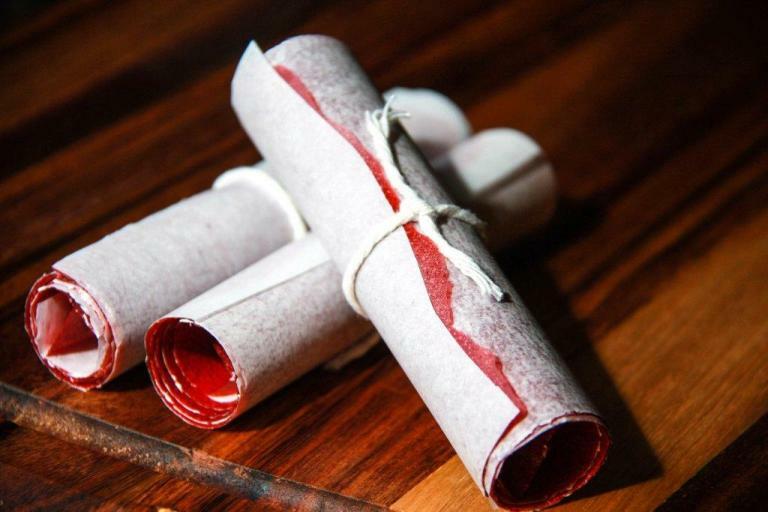 If you do not have a dehydrator, you can make the roll-ups in the oven by following Catherine McCord’s method on her blog, Weelicious (Click HERE). Please note that I am a Vitamix affiliate…and I wholeheartedly endorse the use of their wonderful product. I have to admit that when I first saw an entire chapter on juices I didn’t expect it to be worthwhile. Boy was I wrong! My mouth began watering just reading the recipes. Mike’s juice recipes are genius and simple. My favorite new juice is called “Drinking Dessert” and consists of apple, sweet potato, cinnamon and nutmeg. Why didn’t I ever think to juice sweet potatoes??? In addition to wonderful juice recipes, Mike prefaces each juice recipe with a quick explanation of the nutritional benefits of that particular juice. With over 300 recipes in the book, I have flagged many to try, however seeing as I am not a fan of agave, I will need to make some substitutions since agave nectar is used prevalently in the book. One other point to keep in mind when perusing raw cuisine is that the use of nuts and seeds (along with coconut oil) tends to be very high and this cookbook is no exception. While those types of recipes are fine on occasion, I don’t believe nuts and seeds should make-up such a large percentage of one’s diet. As I mentioned earlier, I did not expect to be as impressed with this raw recipe book as I am. 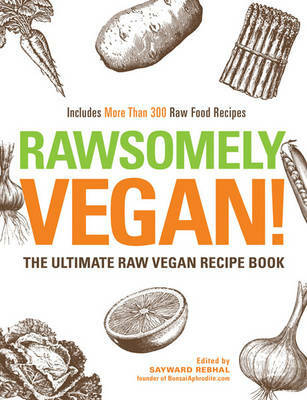 If you or someone you love is a raw foodie or dabbles in it, this will be a wonderful addition to their library…I just wish there were more photographs! It is the height of citrus season here in California. A few weeks ago I went to the farmer’s market on Friday and couldn’t help but bring home a huge variety of citrus. Blood oranges, tangerines, Cara Cara’s (one of my new favorites), and some of the sweetest grapefruit I have ever had followed me home. It was a gorgeous day and nothing sounded better to me for lunch than a nice plate of citrus. One of the vendors was selling gorgeous mint, so naturally that needed to come home with me too. Cover the dates in filtered water. Cut the rind from the citrus being careful to remove all of the pith while preserving as much citrus meat as possible. 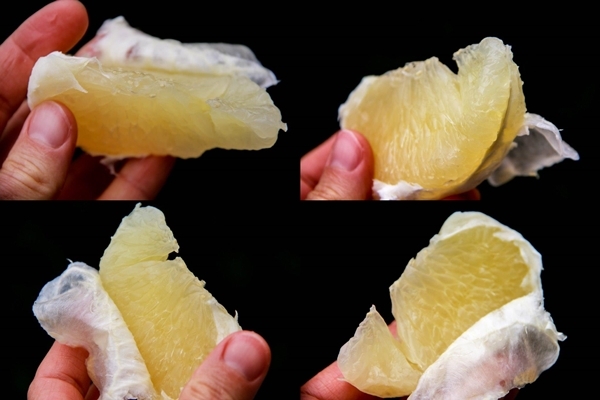 Once the skin and pith is removed, slice the citrus horizontally. 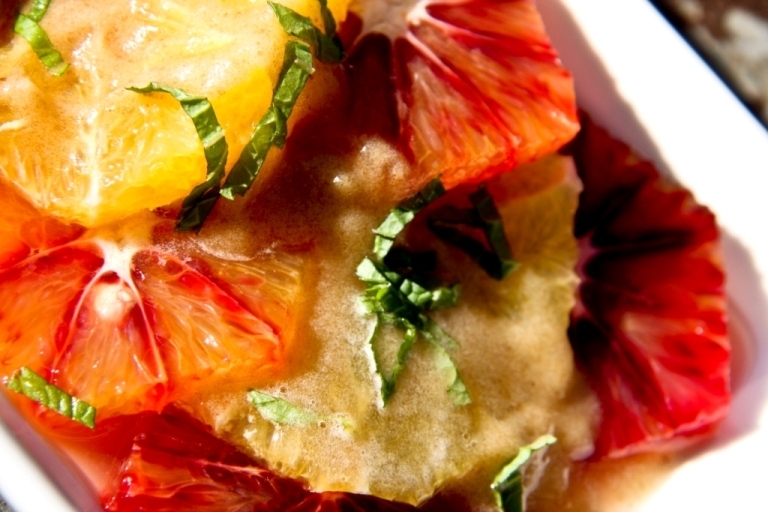 Plate the prepared citrus by alternating varieties. Pour the dates and soaking water in the high speed blender and blend until smooth. 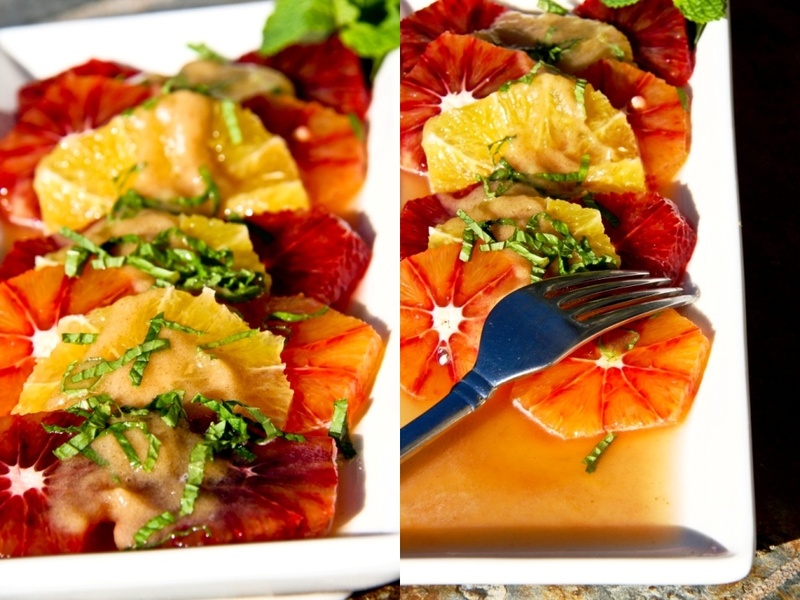 Lightly drizzle the citrus with some of the date syrup and sprinkle with mint. I dreamed-up this recipe while on a bike ride two days ago. 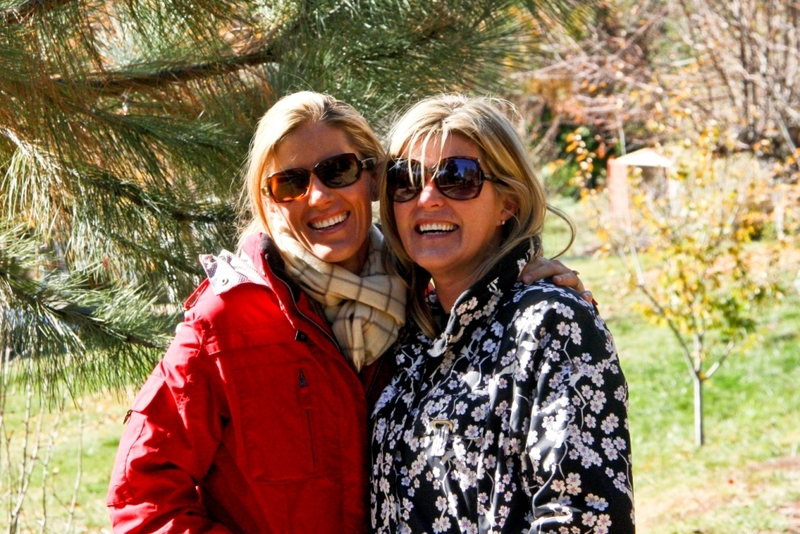 It had been grey and cold outside (In my native Californian opinion). Finally on Wednesday the crisp air turned blue and it was gorgeous. Despite this, I planned on working all day on the backlog of posts I had been meaning to write. Enter other plans…I was hit with a computer virus. While the virus scan was going there wasn’t much writing I could do, so I decided to hop onto my trusty mountain bike and get outside. Sometimes things happen for a reason. It felt so good to be outside enjoying the beautiful day. Out of nowhere I began to think about corn and how wonderfully sweet it is all on its own. Quickly my mind turned to apples and it all came together when I realized how nice it would be to combine the two. 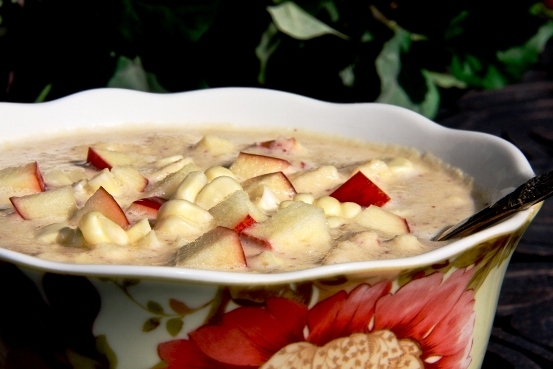 Sweet Corn and Apple Porridge was born. I really wanted to keep the ingredients to a minimum for this recipe. When you are working with so few ingredients, the quality of those ingredients is paramount. 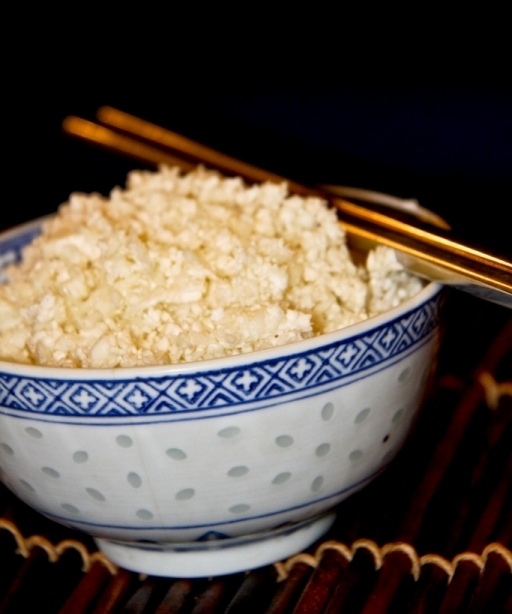 The end result of this porridge will be drastically different if made with ingredients sourced at your local farmer’s market versus the grocery store. Using superior ingredients will also reduce (if not eliminate) your need to sweeten the porridge with stevia; I didn’t need any. 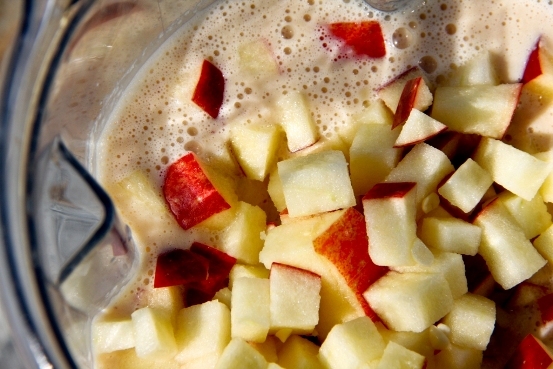 Pour the apple juice and non-dairy milk into your high-speed blender (I used my Vitamix). 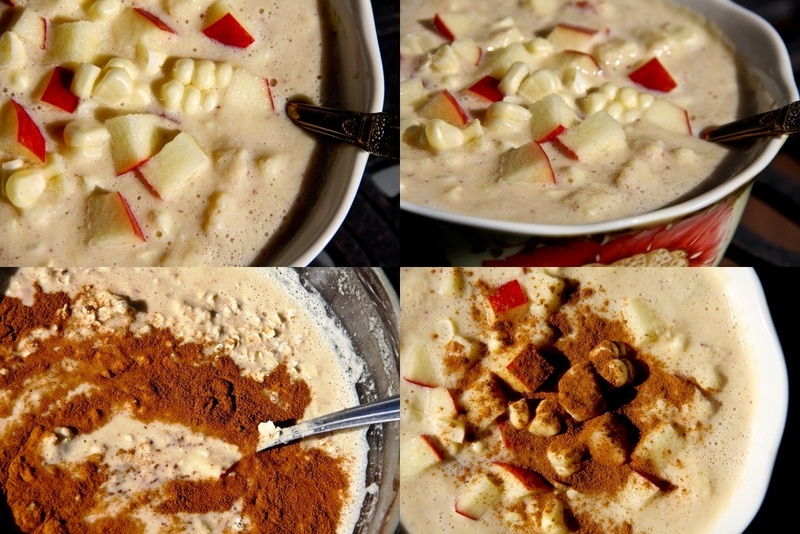 Add 2 cups corn, and half of the diced apples to the blender. Blend for 1 minute until very smooth. 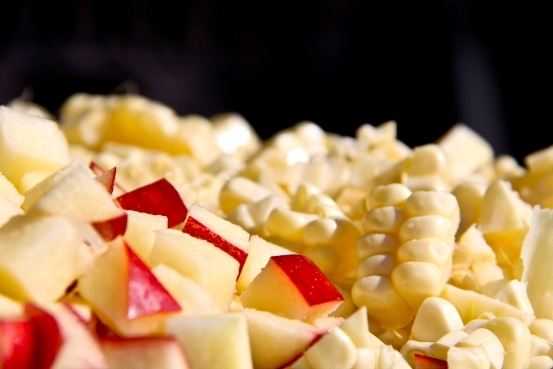 Pour the mixture into a bowl and add the remaining corn and diced apple. Mix to incorporate. At this point either serve the porridge cold or heat it gently on the stove until it is warm. 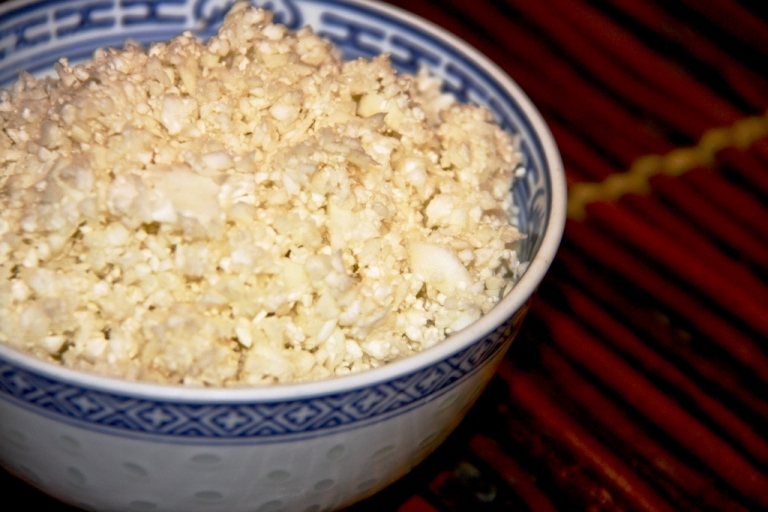 I ate a large bowl of the fresh cold porridge. Afterward I added some cinnamon to the remaining porridge along with the gluten-free oats and put it in the refrigerator. A few hours later I snacked on this and it was soooo good! I ate the ENTIRE batch myself in the span of a day…I promise to share next time! I am totally going to toot my own horn when it comes to this one… fast, simple, healthy, and soooo tasty! I have been in love with this slaw and have been eating A LOT of it. This makes the perfect snack or after meal dessert. I really love the flavor combination and the fact that it is all WHOLE food. I did not include measurements for the ingredients because this is not a recipe that needs exact measurements. Simply make as much as you would like. The slaw does keep well in the fridge as long as you do not add the raisins or walnuts until you are ready to serve / eat it (or they will become soggy). I used equal parts apple and carrot. 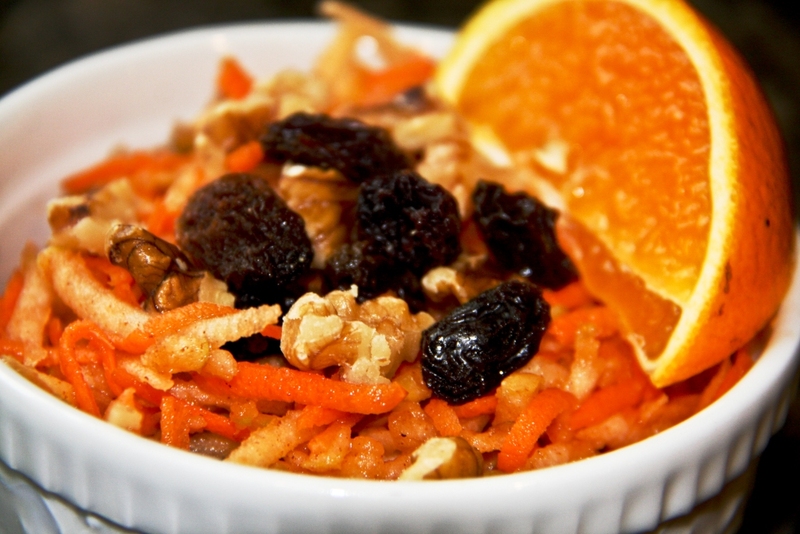 Put the shredded apple and carrot in a bowl and mix well. 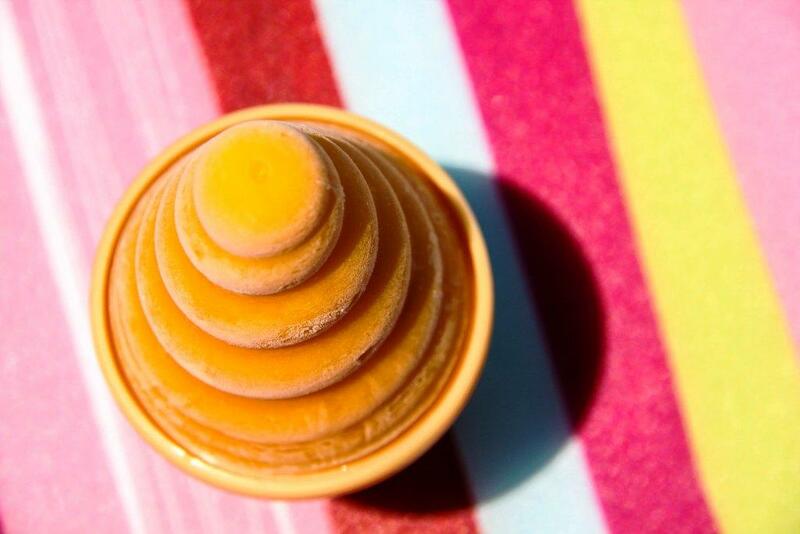 Squeeze the orange juice onto the apple and carrot, sprinkle with cinnamon to taste and mix to incorporate. 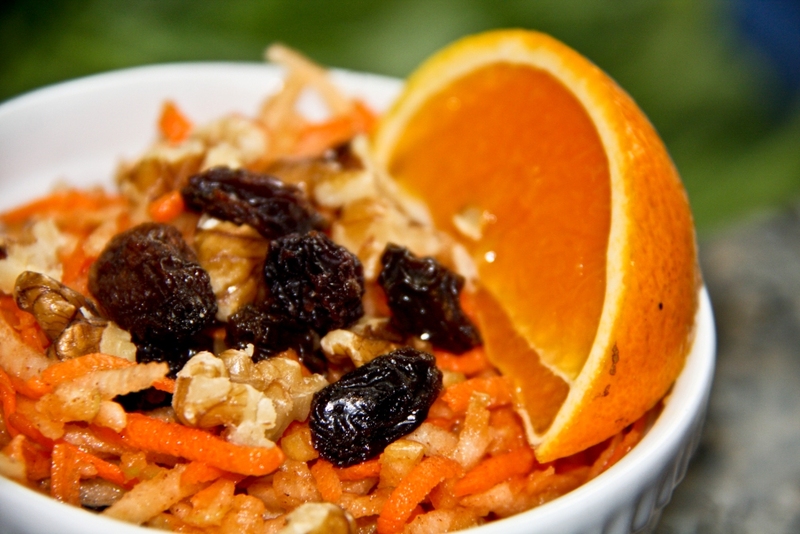 If you plan on serving the slaw immediately, go ahead and mix in the raisins and chopped walnut. Otherwise wait until you are ready to serve the slaw and add them at that point or allow people to top their slaw themselves. Dried apples are so yummy. 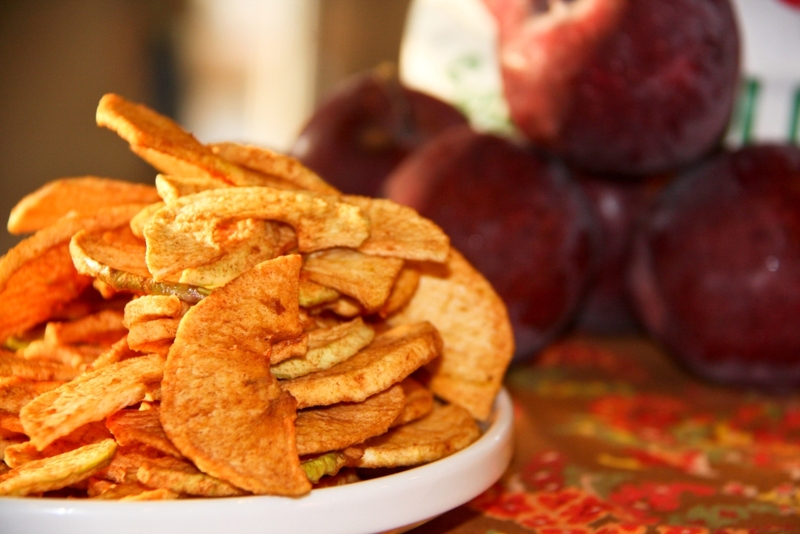 With our recent trip to the apple orchard (click here for the post), I had a TON of apples to use and since we all love dried apples, we thought we would try to make some. 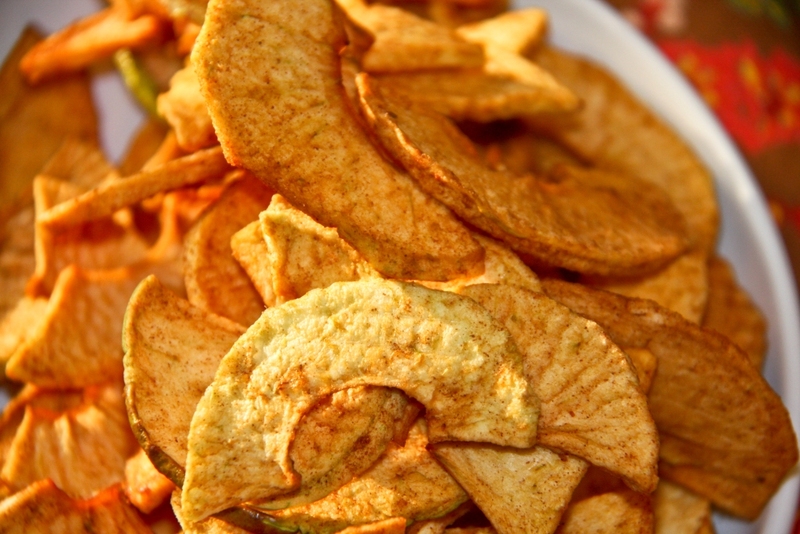 One of the great things about dried apples is that you needn’t worry about whether or not the apples you use are pretty (clearly the one below was not)…all that matters is that the apples are tasty. 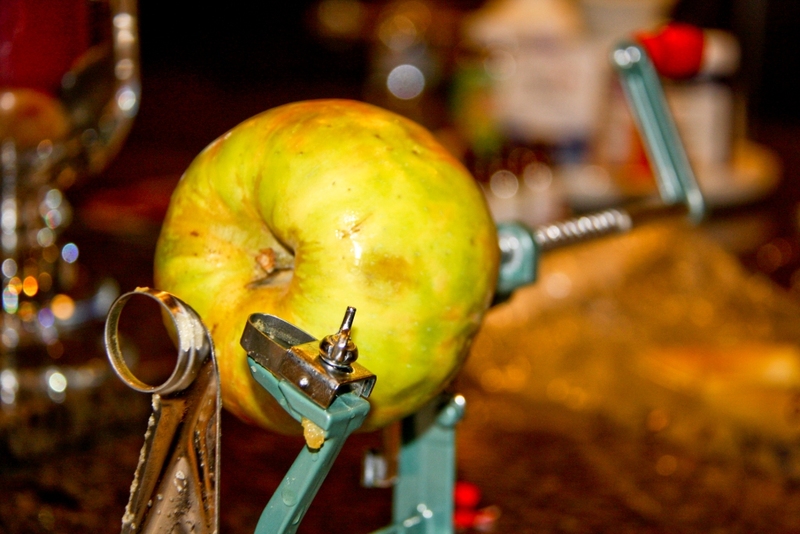 My parents bought me an apple peeler (NORPRO Apple Master) while at the orchard and it has quickly become one of my favorite kitchen gadgets…it makes the peeling, coring, and slicing of the apples as easy as pie (sorry, I couldn’t help it). When prepping the apples all we had to do was push them onto the gadget, spin the handle, take the cut apple off and slice it down the middle to make little moons. The slicer also makes the cuts perfectly uniform which means that the dehydrating time is even for all of the slices. While the apples were nice and sweet on their own, we thought we’d sweeten them-up a little bit more by making a syrup from the fresh cider that we pressed at the orchard. 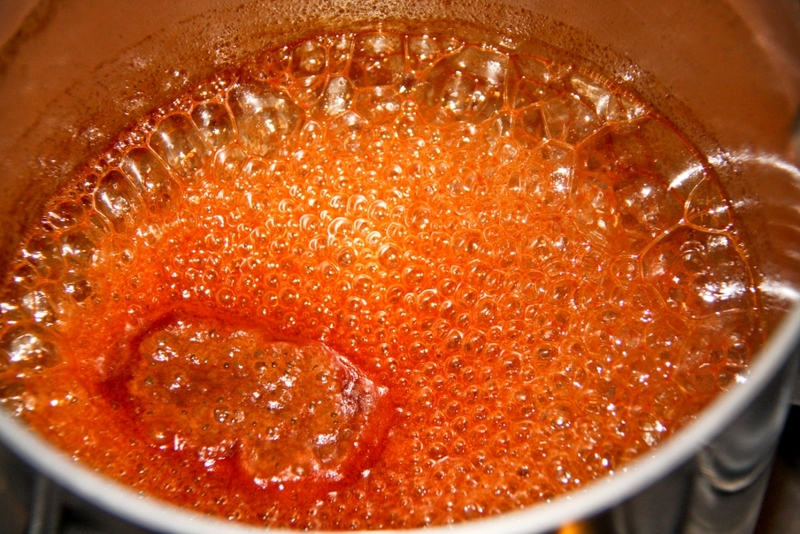 All we did was pour some cider into a saucepan with some cinnamon and simmer it until it reduced down to a syrup. 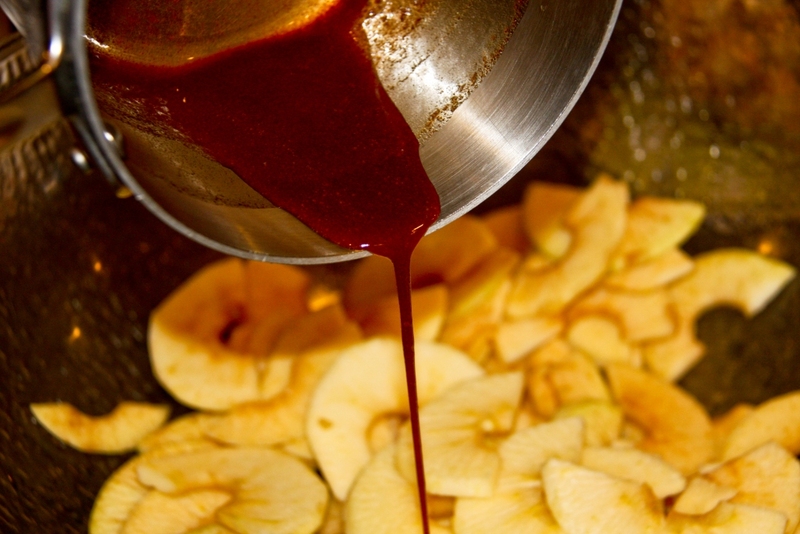 We poured the syrup over the apple slices and them tossed it all together. 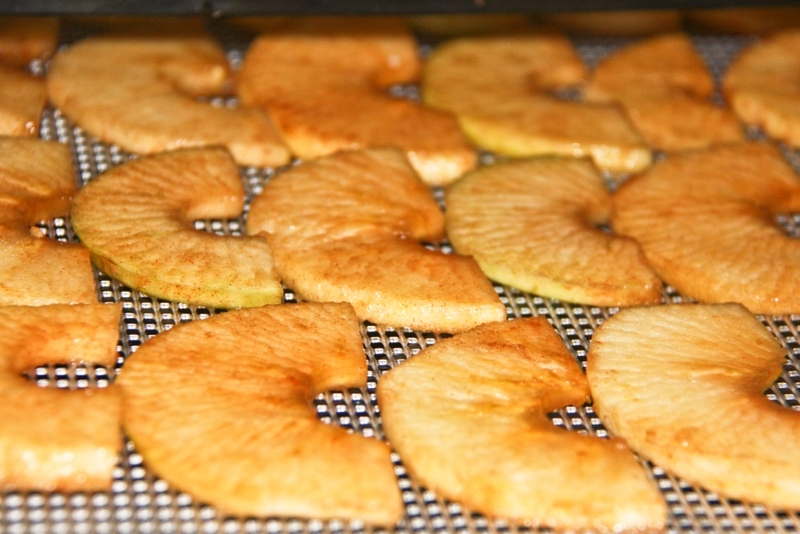 We then placed the slices on the mesh trays of my Excalibur dehydrator and dehydrated them at 115 degrees until they were as done as we liked. I wish I took note of the exact timing, but I didn’t. I believe it took about 4-6 hours. 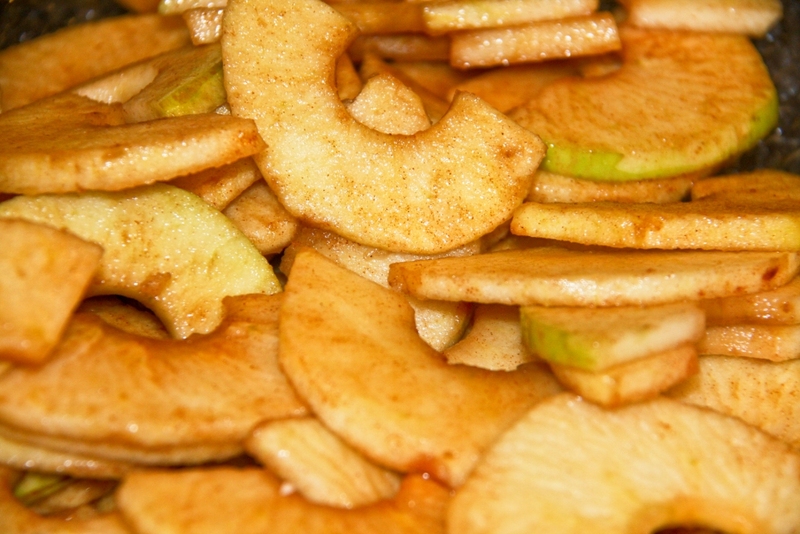 The dried apples turned out perfectly with a touch of extra sweet and cinnamon. 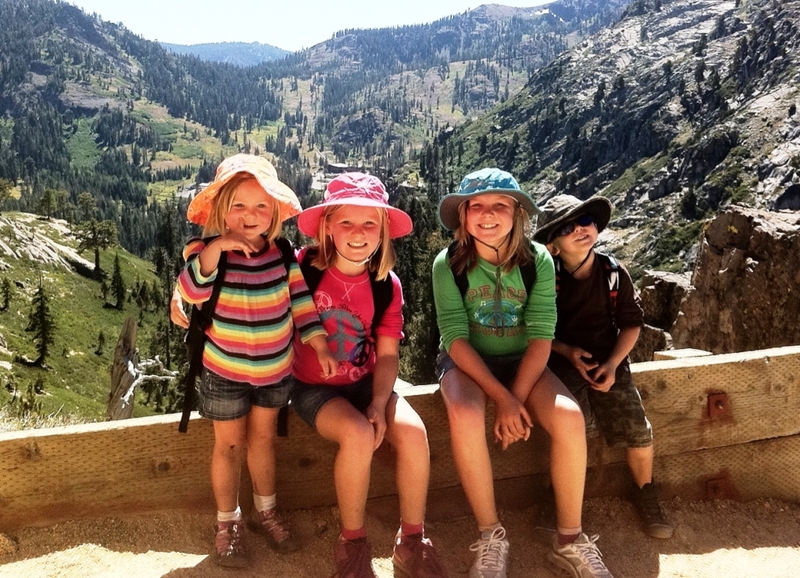 The kids love it when I put them in their lunches.